It doesn't always have to be expensive, but it does have to be fun & 'full'-filling! 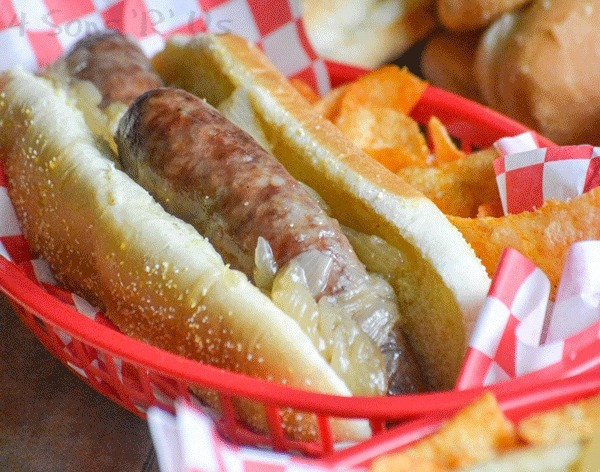 The perfect Summer main meal, these Smoked Beer Brats With Caramelized Onions make a mean sandwich that will leave everyone begging for seconds. While I can clean, and do, I absolutely loathe it. Have since as far back as I can remember. All the way back to the first time I remember trying to stuff all the contents strewn about my floor into my closet, abd breaking down into tears in a crumpled heap on the floor because my Mom found it and slowly pulled everything back out. One item at a time. And wouldn’t leave my room until I’d put everything in it’s proper piece. Every. Single. Thing. A moment of silence to lament the woes of childhood. Joking. My Mom ran a tight ship, and as an adult/parent now myself, I realize how much I’m the better person for it. That being said, with a drive for cleanliness not being my strong suit. It can make me question my life choices. I mean I make food and dirty dishes for a living. Hello? I chose to become a food blogger. What was I thinking? I don’t want to live in dirt or squalor. But I’m more of the mind that the dishes are done, so it’s totally OK if they wait in the drainboard overnight. You know, until I feel like putting them away in the morning-ish. Not gonna lie, it’s led to more than one bit of bickering between the Hubs and I. The house not 100% in order before he goes to bed skeeves him out. He just can’t deal. He also doesn’t always feel like doing it himself (insert eye roll here). What can I say? Opposites attract? And there are other qualities about each other we love more, lol. That being said, it has led me on a focused mission to find meals that are loaded with flavor- but require minimal dishes. One pot dishes. Sheet Pan Suppers. Crockpot Dinners. They’re my bread & butter. My jam, if you will. This is reason 1,039,587, that I adore my electric smoker. Minimal prep. A few dishes to get us going, and then I pop our meal in and wait while it slow smokes to a thing of edible beauty. It’s like a bit of actual culinary magic! 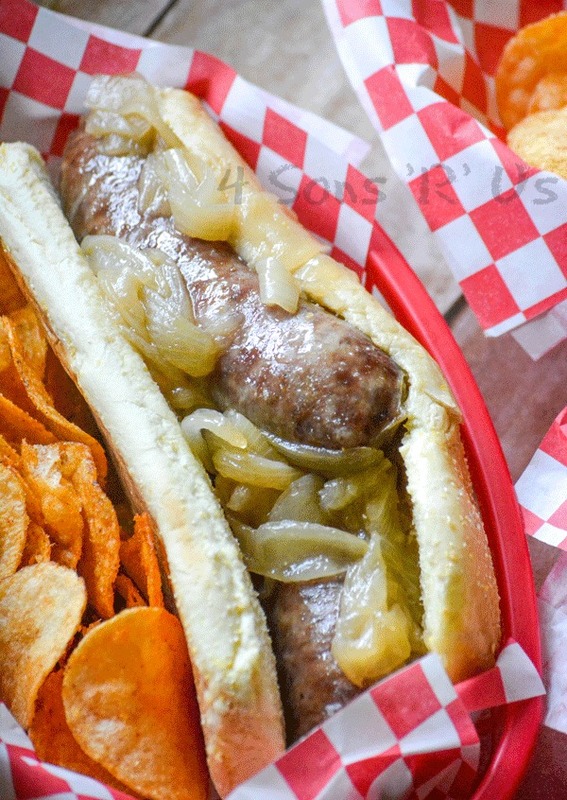 Our Smoked Beer Brats With Caramelized Onions are no exception. 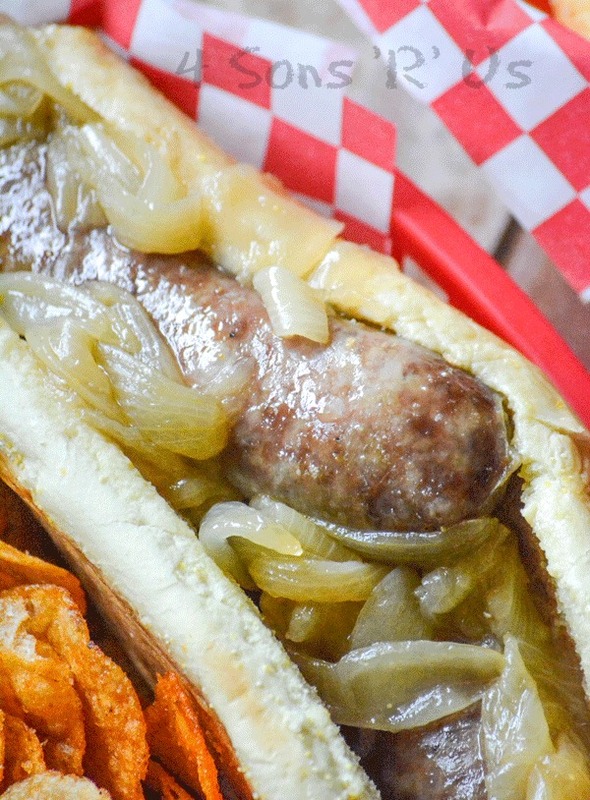 It’s Summer, and there’s naturally nothing more appropriate for the season than a good brat. 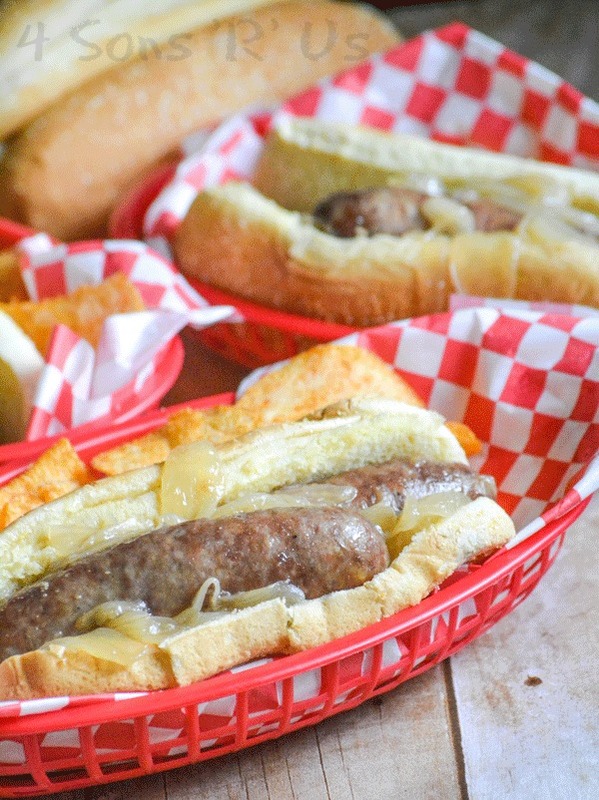 These Smoked Beer Brats With Caramelized Onions are the perfect dinner dish to stuff into a sandwich. Skillet sizzled and then infused with a bit of beer and caramelized onions to boot, these brats are then transferred to a smoker to finish cooking. 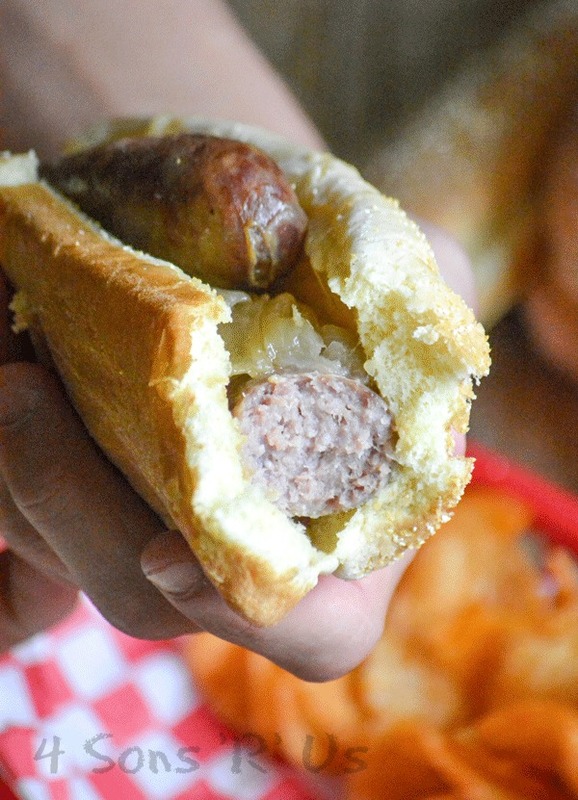 Stuff these smoked brats into a fluffy bun and top them with a generous helping of caramelized onions and a drizzle of sauce for the perfect summer sandwich. In large skillet, melt the butter over medium heat. Add in the onions, stirring until they're tender and clear. Stir in the brown sugar until dissolved. Reduce the heat to low, and add the brats to the pan. Pour in the beer and cover the pan. 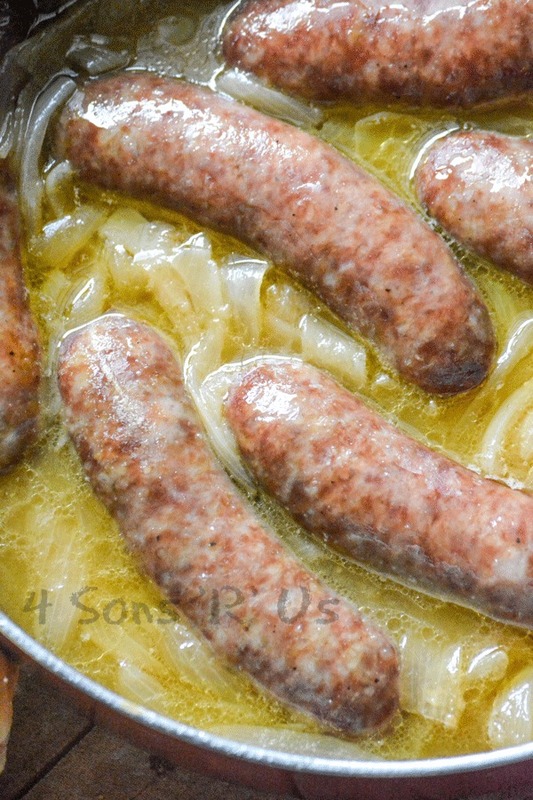 Continue cooking the covered brats for 25-30 minutes, allowing the beer to cook down and the onions to caramelize. 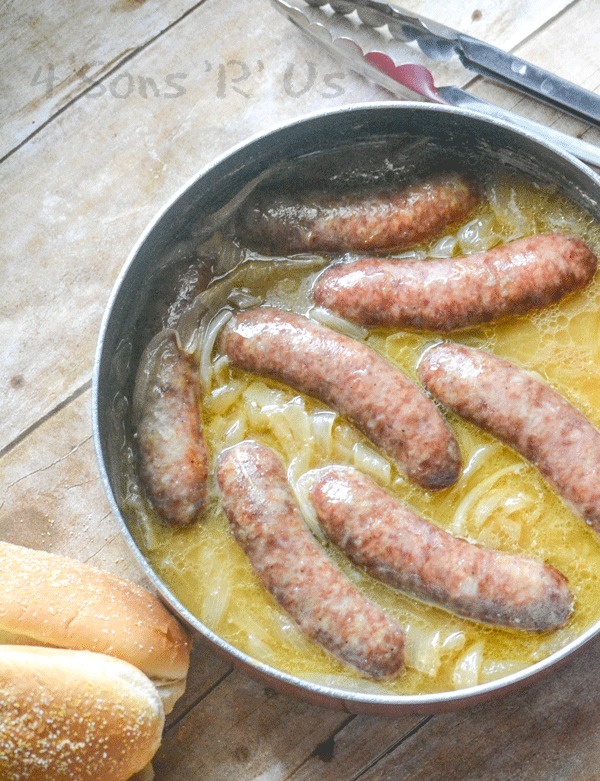 Transfer the brats to a smoker safe dish (leave the onion in the skillet, and set aside). Using hickory chips, smoke the brats for an additional 1-2 hours at 225 degrees. Stuff the brats into your favorite buns. Serve them topped with warmed caramelized onions. These sound so good, I’m literally salivating! Never tried smoking meat before, and I can image how heavenly these would taste. Thank you for sharing it at the Fiesta! Subscribe To 4 Sons 'R' Us Emails!